I love all of the jewel tones I'm seeing this season - deep shades of purple and plum, royal blues, intense teal and bold shades of fuchsia; both in fashion and interior design trends. This color palette is rich and sophisticated, and I like the idea of mixing these strong colors with gold and copper accents. 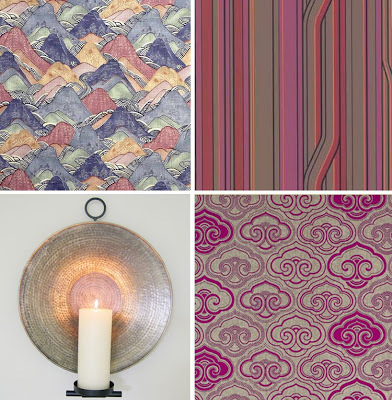 Resources (starting @ top, clockwise): Image via Domino; Photographic print Marrakesh Market, Morocco by Peter Adams; Belmont Lamp; Savoir Chair; Hammered Wood Side Table; Beaumont Pillow; Edo Linen -Opal fabric by Kelly Wearstler; Pinstripe Raspberry Wallpaper; Cannock Fabric - Osborne & Little; Round Reflector Sconce - Global Views. 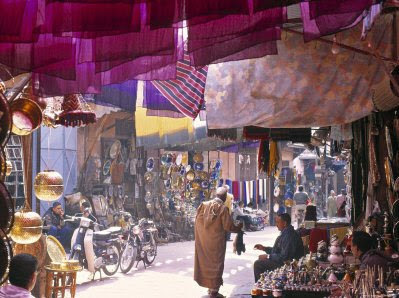 i love the strenghth of each color and the copper sort of softens the tones a bit. plus, i love adding metal elements when designing. they give a bit of sparkle. how is your furniture make over business progressing? are you having fun? I've bookmarked you :) Such a loverly blog! LOVING the jewel tones... I'm a huge fan! Although, every time someone says the phrase "jewel tones" I think of high school show choir. They always wanted us in "sparkly jewel tones, girls. Sparkly jewel tones!" terrifying... but the actual jewel tones are splendid! 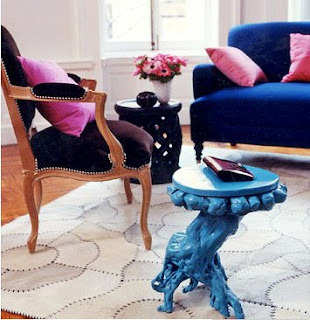 i would die for that bright blue side table! The first photo from Domino is one of my all time favourite interiors---so many great textures! I also used that pic for a recent post I did on jewel tones; they're EVERYWHERE this fall! I love that gorgeous blue couch in the first photo. And that purple wallpaper is wonderful! i especially love the ones in the magenta family! guess what! my domino book came yesterday! it's a really nice book. i put a little post on my blog about it. Whoa! Loving the Indian-inspire palette! avant garde actually pointed me in the direction of your blog and let me know you are a fellow ASID member! I was saying that I thought it was rare to find blogs by ASID members, but here you are! I'm on the Michigan State University ASID Student board but will bridge to allied when I graduate. I'm loving your blog, I will definitely have to explore it more when I find the time between projects and such. I'm also really interested in hearing more about starting your own business, since that is my dream for the future! 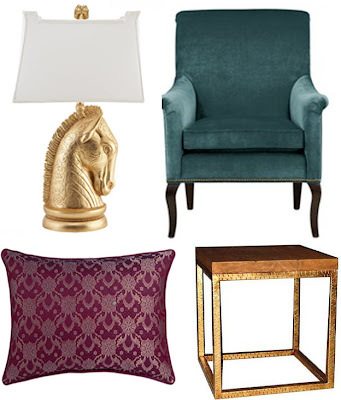 Great finds...especially the turquoise table! I love that square side table... My parents' had some like that back in the day. I LOVE all these colors - excited for the fall season! Oh my gosh, that fabric is to die for. What a wonderful set of pictures. how pretty. i usually buys a few new accents to give the house a new look every season.